Samples of Darwin glass range in size and color. White glass make up less than 3 percent of all finds. Scientists have found organics from Earth's swamp trapped inside of glass created by a meteor impact almost a million years ago. The tiny pockets, only micrometers across, contain material such as cellulose and proteins. Though the impact glass was found on Earth, scientists say that similar samples could have been thrown into space by this or other blasts, allowing organics to be transported from one planet to another. Approximately 800,000 years ago, a rock 100 to 160 feet (30 to 50 meters) across crashed down in Western Tasmania, Australia. As it slammed into the Earth, temperatures exceeded 1,700 degrees Celsius (3,100 degrees Fahrenheit), melting rock and creating glass sphericals, as well as a quarter-mile wide hole known as the Darwin Crater. "The reason the glass is so abundant seems likely to relate to the presence of volatiles like water at the surface when the impact occurred," lead author Kieren Howard of the City University of New York told Astrobiology by email. In Tasmania, the land was covered by swamps and rainforest, offering sufficient water to create the glass. According to the authors, glass from the Darwin Crater is the most abundant and widely dispersed impact glass on Earth, relative to the crater's size, with glass scattered across 150 square miles (400 square kilometers). In fact, the widespread glass led to the discovery of the crater, which is now filled with younger sediments, in 1972. Varying types of glass form from impacts, depending on the rocks laying at the surface. Darwin contains quartz-rich rocks that create white colors, though other rock mixes in to create different shades. Australia's Darwin Crater. The crater is reportedly challenging to reach, situated in the middle of a lush forest. The crater is reportedly challenging to reach, situated in the middle of a lush forest. "The greater the proportion of shale molten to make the glass, the darker in color it gets — from white through light green, dark green, to black," Howard said. The white glass blends in with quartzite samples in the area, making them a challenge to pick out. 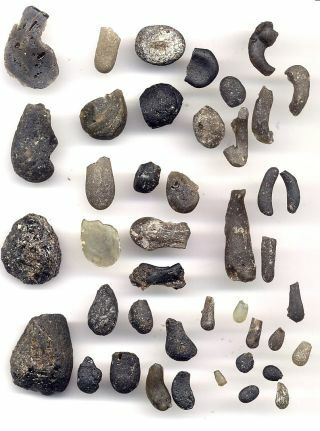 White Darwin glass fragments make up less than 3 percent of all finds. The authors suggest that, in less well-preserved fields, the tiny fraction of white glass could easily remain undiscovered. Howard and his team weren't originally looking for organics. But when they examined the glass, they found surprising evidence of crystalline quartz. "I went looking for crystals in the glass, only to discover the spherical inclusions," Howard said. Early Earth was bombarded by impacts. Such collisions could have trapped organics within glass sphericals and launched them into space. Inside the tiny crystal pockets, spheres up to 200 micrometers in diameter contained organics including cellulose, lignin, aliphatic biopolymer, and protein. The signature from the biomarkers suggested that fragments of peat were trapped in the molten glass, rapidly heating and degassing to create a frothy, bubble-like texture. Trapped inside of glass, the organics would have been prevented from breaking down via oxidation. Howard's samples showed no signs of fossilizations, indicating that such trapped organics could last as long as the glass around them. "Providing the glass seal isn't broken, it's a good preservation method," said organic geochemist Stephen Bowden at the University of Aberdeen in Scotland. Bowden, who was not involved in the research, has previously studied fossil organic matter within impact rocks and its survival during atmosphere re-entry. "[It's] like setting something in resin or amber — like a scorpion novelty in a glass paperweight." The research was published in the journal Nature Geoscienceon November 10. Finding organics inside of glass could have extensive ramifications. Though Howard found glass spheres that crashed back to Earth, other spheres could have been hurled into space, if their velocities were high enough. Impacts on Mars could have resulted in glass sphericals that trapped any organics, if they existed. Organics launched off the planet could have traveled through space to seed other bodies, suggesting a possible method of travel for panspermia. This theory suggests that life did not originate on Earth, but traveled here from elsewhere in the universe. Rocky bodies such as Mars, the Moon, and Titan could potentially have organics trapped after impacts hit their surface, though Bowden says that without further evidence, "this is still speculation." Even if ejecta from icy moons such as Jupiter's Europaformed around organics, they would be composed of ice, which would easily be breached when they melted. Bowden went on to point out the difficulty of locating such finds on Earth. "The volume of organic matter is small in comparison to the volumes of rock and sediment that are thrown up," he said. "After a few seconds in the hot ejecta, it's an even smaller volume of organic matter being diluted by a lot of rock and sediment." But although the white glass only makes up a small percentage of the Darwin ejecta, Howard remained positive about the potential for similar discoveries of preserved organic biomarkers in other impact glasses and tekites here, and perhaps elsewhere. "Impacts are the most common geologic process in the solar system. Mars is littered with craters and known to have impact glasses across its surface," Howard said. "We've shown these glasses are potentially some of the most stable organic repositories imaginable, so yes, if looking for biomarker evidence of life on Mars — or any other planet — impact glasses are prospective targets." The challenge, he noted, is discovering the tiny inclusions. Still, on Earth at least, the capture of organics could be more abundant than previous finds have indicated. "To the uniformitarian mind of a geologist, finding a discovery like ours suggests it’s a product of a common process," Howard said. "Ultimately, impacts are impacts and organics are abundant — and apparently more resilient than we ever predicted, at least in terrestrial settings."